Post-tasting glow with Pier Busso and Ronnie Grant. If you’re anywhere near the Italian wine industry you can’t escape the yearly tidal wave of Vinitaly. This annual trade show is, in the words of my colleague Michael Whidden, “airplane hangars filled with the world’s most incredible Italian wine bars”. He’s right- Vinitaly is totally overwhelming. Tasting with the Brunello Consorzio- choose from hundreds of current vintages and they magically appear at your fingertips, poured by the AIS sommelier on staff. Booth after booth represented by Italy’s finest winemakers at your fingertips- it’s easily the best place to learn about Italian wine every year. That is, of course, if you can book a flight, a hotel room, a rental car, and then somehow manage to get yourself near the fair each day, park your car, hike from your car to the show, all on about 4 hours of sleep each night. This is Double Days. This is the Italian Wine Olympics. This is Italy’s beautiful chaos in action as hundreds of thousands of people descend on the quaint little town of Verona each year for Vinitaly. Tasting with Roberto Minuto of Cascina Luisin. Here are a few images that really encapsulated my time at the sow this year. For more photos, check out the album I downloaded to the AI Selections Facebook page. And while you’re there, “Like” us too. Lots more Italian Wine Geekery coming soon! Lorenzo Marra of Schola Sarmenti taught me more about Puglia in an hour than I have learned in 10 years. Talk about tasting with a legend. Luca D’Attoma is King. His Biodymanic winery Duemani really is fantastic. You must taste these wines to believe them. Marco Moroder, Mayor of the Marche. Not only does he make amazing wines, he also cultivates over a hectare of various varietals of mint, just so the barmen of Marche can make mojitos. Paolo Pasini of San Giovanni. His chiaretto is legendary, and so is that smile! This has to be on of the happiest Italians I have ever met. Must be all that Trebbiano di Lugana he’s drinking! Tasting with Enzo Brezza. One of the highlights for me- you can never taste enough, or learn enough about Nebbiolo. Especially when you have the chance to learn from a master like Enzo Brezza. Seriously.. check out the rest of my photos here. If you’ve never been to Vinitaly, this will give you an idea of what you’re missing. Viva Vinitaly! A really nice article Joanie! It made me feel like I was there. I was at the Vinitaly in Miami this year, but it’s nowhere near the spettacolo of Verona. Your pictures and impressions really capture the Italian wine industry and I appreciate and share your passion for L’ambiente del Vino. Cheers! After my love of art, I have a great fascination with Italian wine culture – L’Ambiente del Vino. 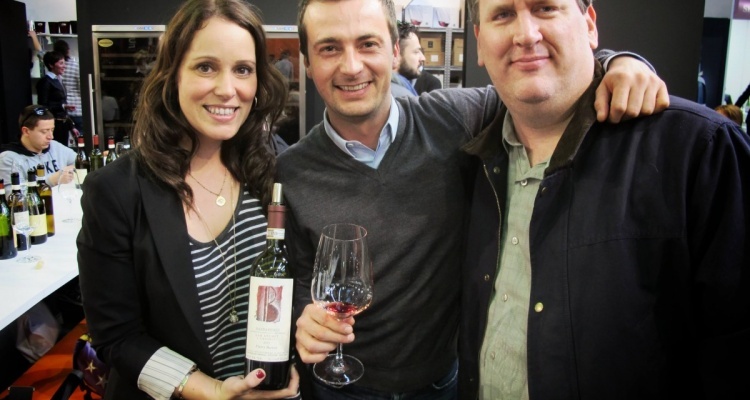 I really like this woman’s blog and this is a great post about Vinitaly. Overwhelming to say the least. I’d rather call it a real mess! Only the last day was acceptable… Nice article, we’re about to write something about it though we didn’t really run crazy about it. Anyway nice to see and read that most of the people liked it!